First Line: Word is that a multimillion-dollar painting proudly owned by the Greek tycoon-"art collector" Panos Papadakis is not quite all it's supposed to be, and if you don't believe me, you can ask Lyons' esteemed Laboratoire Forensique Pour l'Art, which has just finished subjecting two dozen of Papadakis's paintings to its fearsome array of tests. Besides dodgy art, Papadakis has long been suspected of running a multimillion-dollar Ponzi scheme, so art consultant Alix London boards the Greek's luxurious yacht for a cruise of the Aegean. While aboard, she'll give the occasional lecture to Papadakis's guests, but she's also there as an undercover operative for the FBI. Special agent Ted Ellesworth is hoping that Alix will be able to provide the inside information they need to send Papadakis to prison. But she's caught up in a very dangerous mix of art fraud, millionaires, murders, and the Albanian mafia. 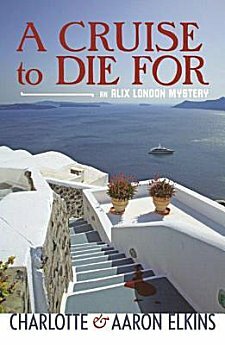 Although this is the second Alix London mystery, A Cruise to Die For is my introduction to the character. Having a "reformed" con man and forger for a father is a double-edged sword. On the one hand, this makes her much cannier than most to the world of art fraud, and I enjoyed the ways in which her father could help her. However, her father's eight years in prison means that Alix has had to start from scratch to rebuild her own life and reputation. This situation could add a lot of interest to the books in this series. The setting of a luxury yacht in the Aegean certainly doesn't hurt, and the insider's look into the world-- and business-- of art is a fascinating one. If you're thinking that I'm about to say "but..." you would be correct. The moment Alix steps aboard the yacht and takes one look at a painting, her reaction is just too naive to be believed for someone who's undercover and has been warned of what's going on. She also tends to be so conventional that it's difficult to become very interested in her as a main character. (For interest, her father wins the contest, hands down.) This book is well-written and has a smoothly flowing storyline. Unfortunately the story and the characters just don't have that spark that kindles a reader's interest and makes them want to keep turning the pages. Hm. That's a shame. I really like the premise, but just from your description, I could tell Pops was more interesting anyway. Sort of like in To Catch a Thief - much more interesting to keep the reader guessing with an bad/good guy protagonist.